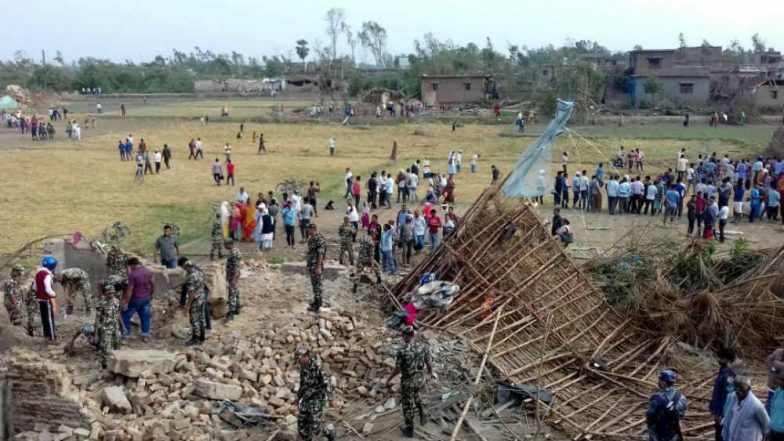 Kathmandu, April 1: At least 27 people were killed and more than 400 wounded after a massive rainstorm hit several places in the southern district of Bara and adjoining Parsa in Nepal, authorities said on Monday. According to Bara’s Chief District Officer Rajesh Poudel, Nepal Police, Armed Police Force and Nepali Army personnel have been deployed to the affected areas for rescue and relief operations. Fierce winds accompanied by hailstorms and rain wreaked havoc in Pheta area of Bara district for over half-an-hour late on Sunday. Hundreds of houses were destroyed in the massive rainstorm. While 26 bodies were recovered in Pheta area, at least one person was also killed in nearby Prasauni village in Parsa district, The Himalayan Times reported. Most of the affected areas are on the Nepal-India border. Indian National Shot Dead in Nepal. According to Parsa's District Police Office, the number of casualties could see a rise as rescue efforts have gained pace at places the details of which were not taken into account while the previous details were recorded. The DPO did not divulge further details. Nepali Prime Minister's Chief Advisor Bishnu Rimal said army personnel have already been mobilised to speed up the rescue efforts. "Two battalions has been mobilised immediately there, here in Mid Air Base, Katmandu; night vision helicopters are on stand by with rescue team. Our security agencies are waiting for favourable weather conditions (sic)", Rimal responded to Province 2 Attorney General Dipendra Jha's call to deploy Nepal Army personnel for rescue ops. Nepal Prime Minister KP Sharma Oli expressed sadness over the loss of lives while extending heartfelt condolences to the bereaved families. "We have kept 2 MI 17 helicopters in standby mode for deployment in case of emergency. A sky truck is ready in Simara," Nepal Army spokesperson Yam Prasad Dhakal told news agency ANI.